Ear, Nose, Throat & Sinus Specialists - Dr. Edgar Lueg, Ventura, CA - How Do I Know If I Have Chronic Sinusitis? This is perhaps the most common question I get from patients, family, and friends. It is also one of the most basic questions I am asking myself when I first see a new patient with persistent sinus or nasal symptoms. Before we get into "how do you know" I want to make sure everyone is on the same page with what it actually is. Essentially it is a chronic (more than 6-8 weeks) inflammation of the thin moist tissue lining ("mucosa") inside the bony sinus air cavities in your face. Many patients assume that it is purely an infection however this is not the case. While bacterial infection is thought to play a role in developing Chronic Sinusitis, it is more than just a simple "infection". It is a chronic, low-grade inflammation of the sinuses. While longer-courses of antibiotics are often prescribed for it they alone are usually not effective in eliminating it. In fact, there is no absolute symptom that guarantees that you have Chronic Sinusitis versus something else. After many years of treating thousands of Sinus Patients I still have the occasional case where my clinical suspicion based on the patient’s symptoms were not correct. One of the most significant factors is how long have your symptoms been present. Generally speaking we do not consider any inflammation in the sinuses or nose "chronic" until it has lasted at least 6-8 weeks. However many patients with Nasal Allergy or "Allergic Rhinitis" have symptoms that persist to vary degrees for that long or longer especially during their allergy season. Because it is so difficult to be certain that someone is suffering from it by symptoms alone I generally recommend that any patient who suffers from persistent bothersome sinus or nasal symptoms for more than a few months be evaluated to rule it out. If I suspect it after taking the patients history and physical I perform a flexible nasal endoscopy to assess the tissue around the sinus openings into the nose. I am looking for swollen tissue, mucosal edema, inflammation and drainage from the sinus opening itself. However unless you have had surgery to enlarge your sinus openings the tip of the endoscope cannot fit through these natural openings to look for it directly. 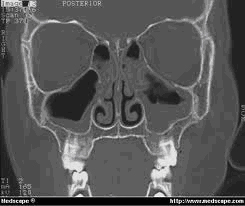 Therefore, the only way to be certain that you are suffering from it is to perform the "Gold Standard Test" which is a CT (or CAT) Scan of your sinuses. 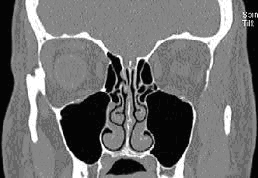 This will show the telltale sign of "thickening" of the lining of your sinuses, seen as gray areas within your sinuses, which confirms that you do in fact have Chronic Sinusitis.